We rely on the generosity of sponsors to help us in our mission to provide HR professionals with the opportunity to grow, learn and develop in their field. We are grateful for each prospective sponsor's passion for our mission. To advance this work, Inland Empire SHRM partners with companies and organizations through sponsorship of our programs and special events. Partnering with Inland Empire SHRM is mutually beneficial – we receive the support necessary to advance our mission and our sponsors receive partnership benefits and positions itself as a supporter of the HR profession. We have sponsor levels for every size company. Whether you simply want to advertise and show support for our chapter, interact with attendees from an exhibit table at a meeting or our conference, or put your company front and center at a high-profile conference event, we have a package for you! Interested? 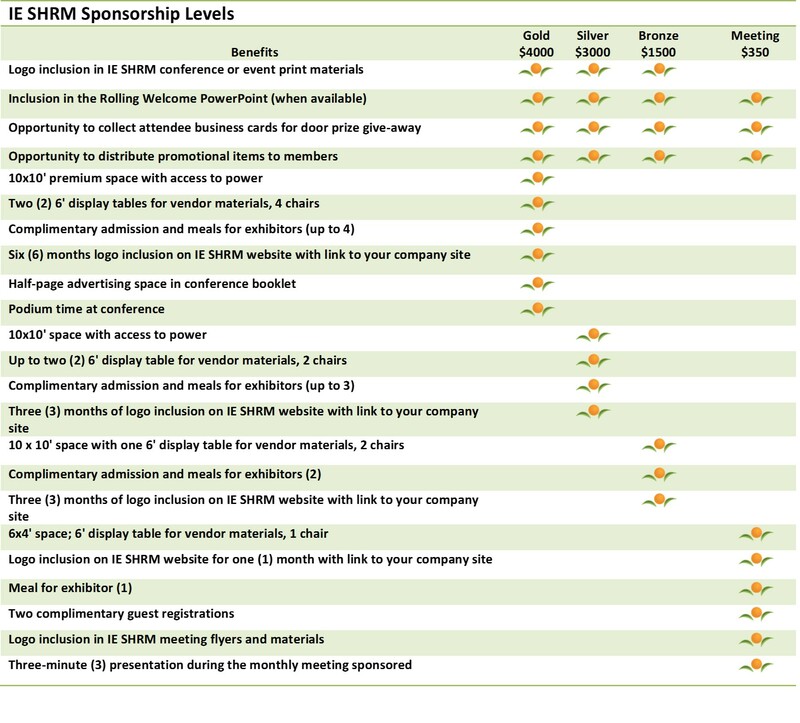 Please email sponsorship@ieshrm.org. All sponsorship opportunities are first come, first served. Exhibit space will be offered in order of commitment.